Sorry, the 2017 flower season is over. Please check back in 2018. 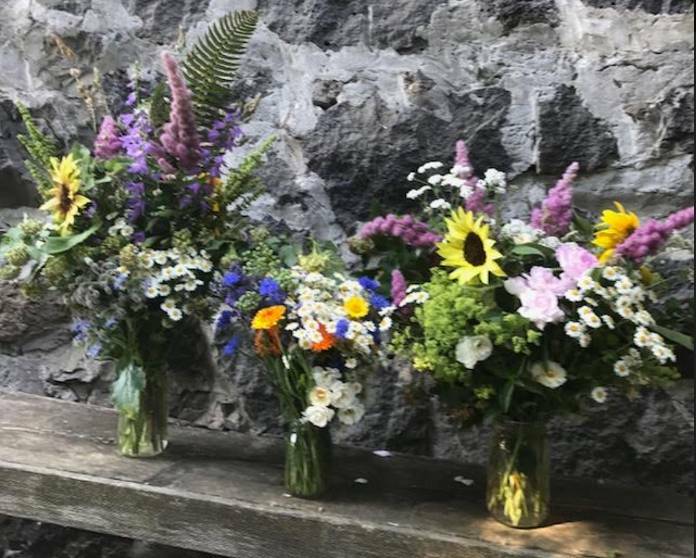 Are you planning a small wedding, reception or special event in Hood River? 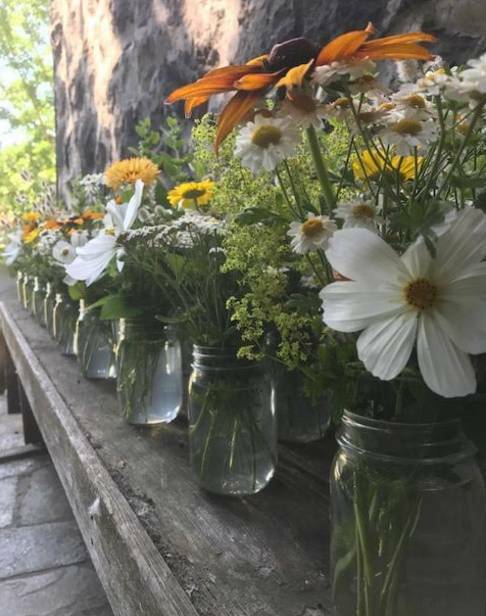 Need custom bouquets or just a few bunches of local flowers? 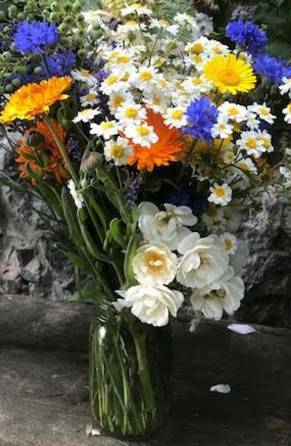 Maybe you want a fresh, local bouquet of flowers greeting your customers or clients delivered weekly? 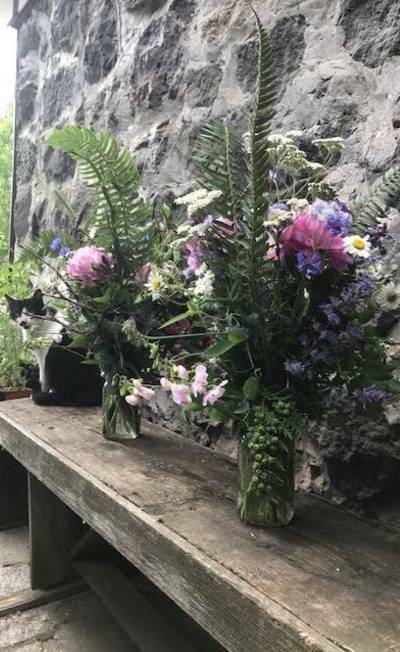 If you prefer fresh, local and organically-grown flowers rather then ones that have been sprayed with pesticides and shipped long distances, please contact us. 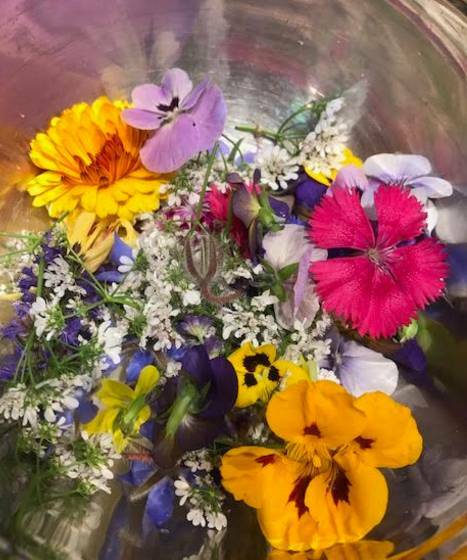 We grow a variety of certified naturally-grown cut flowers that can be arranged and delivered at your convenience. 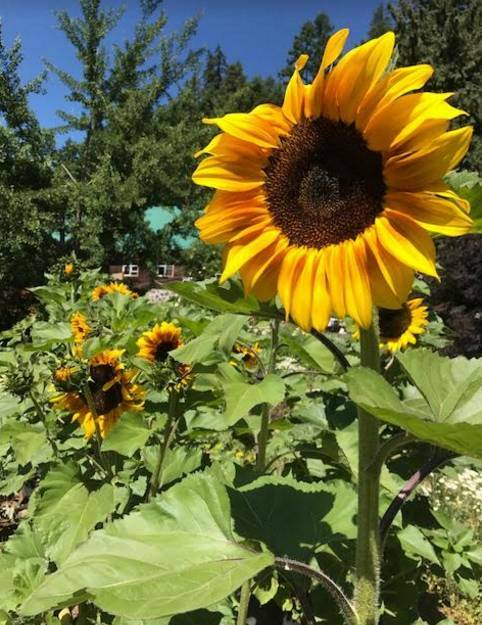 Our cut flower season goes mid-July through end of September. 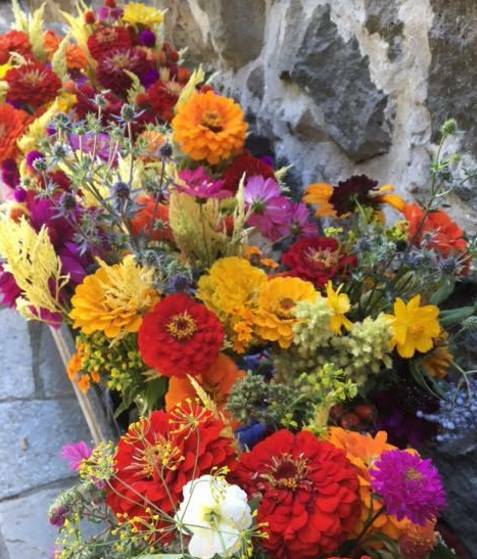 We offer a variety of annual flowers that can be arranged and delivered any day of the week. 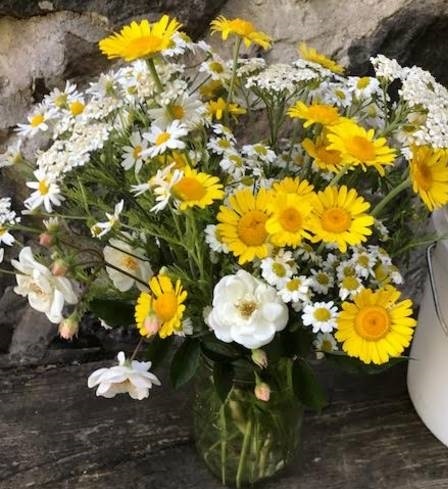 We sell flowers by the pint or quart jar. 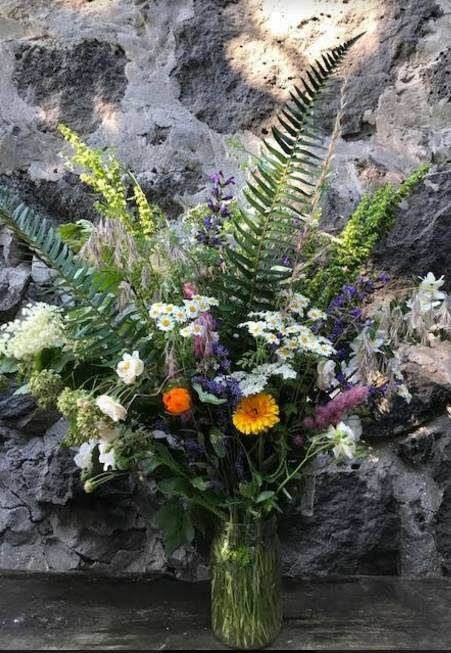 For 2017, our bouquets can be found weekly at Grow Organic in Hood River and at special events and locations through out the Gorge. Flowers that still delight you over a week later is our goal. 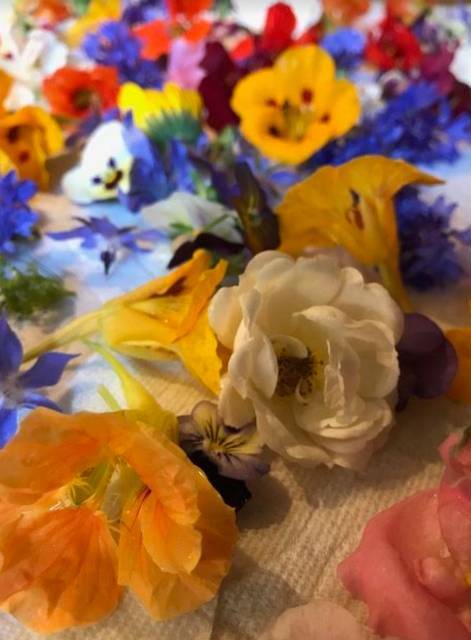 Both our harvest and preservation techniques create a beautiful, long-lasting floral arrangement without the harsh chemicals used by commercial florists. Gifford, the farm tuxedo kitty, shares bench with early season quart bouquets. 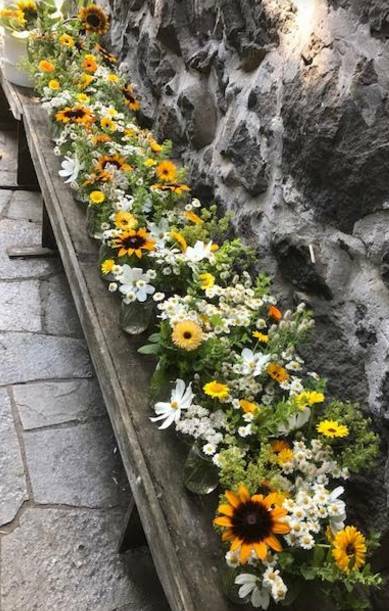 Some of the flowers we planted for the 2017 season include: Dahlias, Sun Flowers, Dara Ammi, Bells of Ireland, Marigolds, Cosmos, Globe Amaranth, Calendula, Paper Lanterns, Strawflower, Peppermint Zinnia, Rose Hips, Bachelor Button, Marjoram, Basil, Sage. GIVE ME FRESH FLOWERS ALL MONTH! 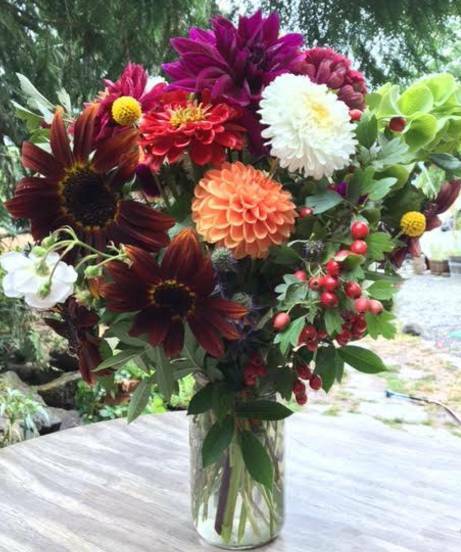 Enjoy the convenience and beauty of a fresh Mason Jar Bouquet delivered to your home or office every week. Choose from pint or quart. FREE delivery within Hood River. Quart $15 a week or $50.00 month; Pint $12 weekly or $45.00 month. Please fill out the form below if you are interested in ordering our flowers. The information we are collecting below is just to get an idea of what you are looking for and does not commit you to buy anything.